Cyber Monday 2015 is just days away and many of us will be crazy browsing the web in search of the best online bargains. In recent years, many of us have turned to the Internet for entertainment, training, information, shopping… The latter in particular has become an increasingly important part of our Internet activities mainly due to the wider selection of products and the excellent level of service offered by most online retailers. There is something to be said about going shopping from home, sitting on our couch after work and sipping from a glass of wine, knowing your purchases will be delivered to your front door in a couple of days. There are two large factors responsible for the vast improvement of nowadays online shopping. Firstly is the much improved user experience brought forward by the quality of the Internet shops, the better presentation of products and the ability to find what we are looking for much faster and accurately. The second factor is the transparency and security of all financial transactions and teh reliability of the transportation methods. 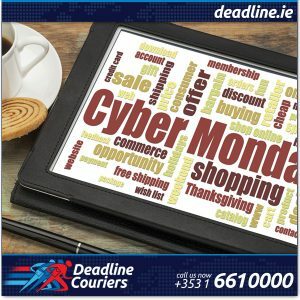 At Deadline Couriers we play a small part of online shopping success in Ireland. For years we have worked with Irish and foreign companies to handle the delivery of their goods both into and out of Ireland. In fact, we are the legs and the wheels behind a number of well known retail companies in Ireland and the UK. We quietly work hard behind the scenes to ensure we keep cyber shopping going. So this Monday, as you find the perfect deal online, it is very possible on of our drivers will be the one knocking on your door.